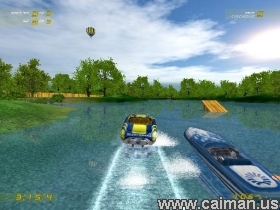 Caiman free games: Aquadelic by Hammerware. Aquadelic is a game based on our work-in-progress project Yaga!, although bit different and created especially for Becherovka Game 2005 contest. 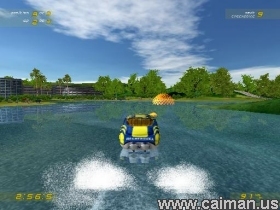 It's 3D powerboat racing game. One player game against computer controlled players is not missing as well as multi player game in split-screen mode ? four players max in a game. One player game can be played in three modes. First mode is race against one to three opponents, second one is time trial against time opponent and the last one is free style mode with no opponents. Multi player game offers just race and free style. If it's not enough, you can add AI controlled players to max four players. There are four different boats that differs not just in appearance, but also in driving capabilities. Only one boat is accesible in single player modes by default. But such a detail like winning the race unlocks other three boats. Aquadelic is result of joint work of Hammerware and Al!eN, music is done by Cognize Coke.